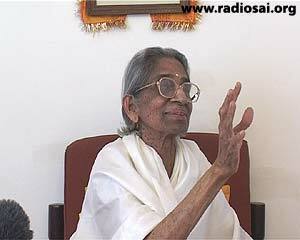 A devout and dedicated devotee for nearly sixty years, Mrs. Rani Subramanian, who originally hails from Tamil Nadu, came to Bhagavan Baba as early as 1950. 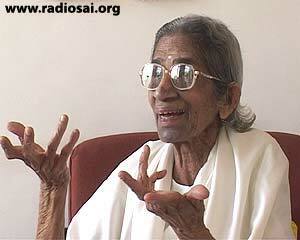 Eighty five years old now and fondly called 'Rani Maa' by Bhagavan, her life is a treasure-chest of scintillating experiences from yester years. A sincere spiritual seeker, she currently resides in Puttaparthi and shares her elevating memories with eager devotees with deep conviction, insight and faith. This is the second part of her wonderful reminiscences; please click here to read the first part again. Once He told me: “Rani Maa, if you have got My Grace, it is because you have lived that life!” It may not be to perfection. You see, when you come to this path with Baba, it does not mean you will become perfect overnight! We have got many shortcomings, many imperfections, which we have to transcend as human beings. For, spiritual life is completely different from what we were used to; our whole life has to be re-oriented, re-organized; it is a big task. Our thoughts, our words, our deeds, everything has to be spiritualized. It is not easy, because we have formed a habit over many births – thinking one way, talking the other way – not in just one birth! We have been living like human beings for many life times, and now suddenly, we have to live a Divine life! For, spiritual life is completely different from what we were used to; our whole life has to be re-oriented, re-organized; it is a big task. Our thoughts, our words, our deeds, everything has to be spiritualized. It is not easy, because we have formed a habit over many births – thinking one way, talking the other way – not in just one birth! What is the Ultimate in Self-realization? To forget yourself! We always want this and that only for our own self – this body! That is forbidden in the spiritual path; you have to forget yourself. First see God in yourself; you must be convinced that He resides in you. You can’t see God in everybody till you see God in your Guru first; secondly in your Self – as the Indweller! So, Swami said: “Go and test Me.” And I tested Swami. What happened was, my husband was a doctor and so, when any illness took place in the family, I could get doctors any time I wanted. Once, when my husband was on a tour - he had to tour the whole of Madhya Pradesh – my son became very ill, and had 103-104 degrees fever for 5 days! One doctor came and saw him, and at first he thought that it was malaria, and then he said it was influenza; he couldn’t find the precise cause. So he went on treating, but my son didn’t respond to any medicine! Swami had told us that to contact Him, you have to do japa, chant His Name. He is hridayavaasi, the Indweller and He is listening not just to me, but everybody else too, because He is within everybody. So the message will reach Him. I had a mantra, so I started chanting my mantra while I sat for a while in the prayer room. My son was maybe 5 or 6 years old, and his fever was not coming down at all! He became delirious! His brain was a muddle. He could not recognize people; he didn’t know what was happening. He would say all sorts of irrelevant things! He didn’t recognize I was his mother; he just looked at me and was running away from the bed and was babbling! I couldn’t understand why he was talking like this! I didn’t know; I thought it was a kind of brain-fever or something similar! I was trying to put him into bed, but he wanted to run! I was worried and wondered what had happened to him! Then immediately, Baba’s thought came in my mind: ‘I told you to test My Omnipresence! Now is the time for you test! Go and pray to Me.’ Not that I heard a Voice or something; it just came into my own mind. I told the maid to somehow manage and look after the child, and I will just go and pray, and return. So I went to my shrine - it was 9 o’clock - and I talked to Swami: “Swami, You said to test Your Omnipresence. Today I need Your Omnipresence, because this child is behaving so queerly! I can’t even understand what is happening! I want Your help! Please come and do something. If You really come and save him, You must fulfill three conditions of mine! One, when I go back now, he should be fast asleep; he shouldn’t be running and saying all sorts of things! Then I will know You are Omnipresent. Then I got up and returned to the bedroom, and I found him fast asleep! Then I asked my maid: “When did he go to sleep?” She said: “Amma, a few minutes after you went, he went off to sleep.” And even after I went, he didn’t get up; he was fast asleep! And in the morning too, he got up very normal! None of that babbling was there! He recognized me as he has always been! I took his temperature in the afternoon and evening – it was 98.4! What more did I need? 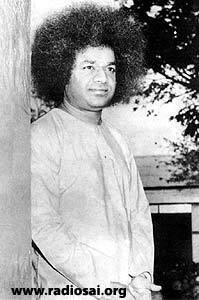 At that time, Swami was in Venkatagiri, with the Maharaja of Venkatagiri and He was talking to them at 9 o’clock. 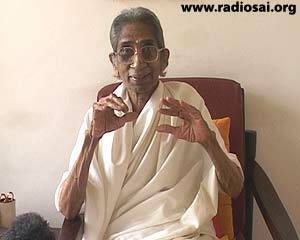 He used to stay with Venkatagiri and Kumara Raja (the King’s son) during the festival of Sri Rama Navami. Maharaja used to take Swami by car to Venkatagiri. He was a great devotee of Lord Rama and for him, Baba was his favourite deity. 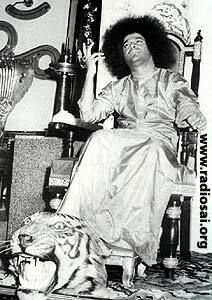 So at that time, when I prayed at 9 o’clock, Swami was talking to Maharaja of Venkatagiri, and He went into a trance! He just fell back and they couldn’t understand what happened! Kumara Raja, thought Swami had suddenly fallen down as if He was unconscious! I used to come to Puttaparthi every six months, sometimes even 3 times a year. I have to tell you, in those days, His aura was very powerful! He could really transform our whole thinking in a very short time! In the first visit itself, within a few days, I could accept anything! Normally, I wouldn’t have accepted rain coming in my own house, I would have reacted! But, I did not react there. He gave us an experience of His Power. Some people may not understand, but in my first visit itself, I could understand; we had Baba’s blessing to understand that He had Infinite Power! How could we transcend? We thought that we would be disturbed, but we were not disturbed at all. We had to go to the hill for the call of nature, but it didn’t bother us that ‘Oh! We have to walk’ or ‘Oh! We don’t have a toilet’; we walked happily. We didn’t have tap water, we had to drag water from the well or walk all the way from the Patha Mandir to Chitravathi to wash so many clothes – with so many children being there - and take it back like a washerman; we were not used to all this! And yet, we used to cry on leaving Puttaparthi! Can you believe it? We didn’t want to go back home! What did He do? It was an overnight change! I consider ourselves very blessed. I won’t say I am that detached now; I may be more aware of conveniences now. But, in those days, He did something to just give us a taste; it was not a permanent acquisition - like Shri Ramakrishna gave Swami Vivekananda the experience of Nirvikalpa Samadhi just for a short while and then took it back and kept the secret. Baba did the same thing; He gave us an experience of His Infinite Power and Grace, that He can do anything, just like that! He doesn’t need time! I don’t have to do sadhana for 6 years to get that; nothing! It was instant; but only a taste of it. With sadhana alone, I can get permanent realization of His Power. Instantaneous indifference to anything happening externally should be our acquisition, our achievement. That is the achievement Swami wants to give us, but we have to work with ourselves. And each one will perform according to their own capacity. Even now, we have to work with ourselves, because so many things are happening in our family; things that we don’t approve of – like tragic incidents; so many things which upset people. It may upset us for a little while – it does not upset us permanently, because we have that knowledge to get over that situation. Why does it not affect us always? We don’t worry - at that moment, yes, we will be upset, because we are not yet stabilized in our jnana; our knowledge. Until that knowledge is stabilized, that permanent acquisition of the equanimity of the mind won’t be available. 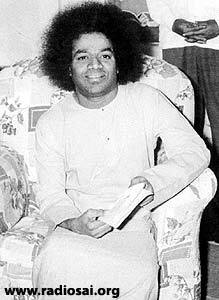 Swami is showing us that through our experiences - something unpleasant may happen, and we may think ‘why should this happen?’ We think about it and give it too much thought – not that we worry, we pray to Swami. But if we give it lot of time and a lot of thought; that is what should not be done. How can you do it? He told me once in Whitefield - which I will never forget - about “Obedience to your Guru.” There’s nothing else you need to know. We now hear His discourses about obedience to Guru. He is not talking about it individually; there are millions coming now; can He talk to every one individually? No! During those days, there were hardly 100 people! So He could give a lot of time. Now, where is there time for Swami? There’s only 24 hours! Hours don’t extend; for Him too it is still 24 hours! He has to fit in so many things; it is impossible for Him now to give interview to everybody or talk to everybody! He had told us about that year’s ago! “You are very lucky! This chance you will not get again! Years later, you will not get this opportunity!” Now do I talk to Swami? No! We just see Swami, and return. I can’t believe that at one point, we had so much joyous time with Him! Once He told me that: “Old devotees must withdraw and go to the back; give place to the newcomer.” That is the Grace of old devotion. What Should We Ask God? Old devotees want to come and sit in the front line and want interviews. What have you imbibed? Nothing! He told me of an old devotee who was a friend of mine, who wanted an interview each time she came. And Swami was very fond of her too. 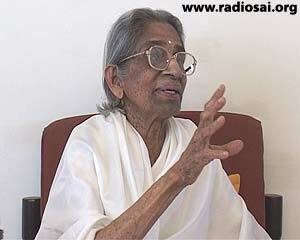 She would come from Madras and stay here for one or two months, and each time, she would ask for an interview before she left. Swami wouldn’t let us; but she would insist; so Swami would say: “Okay, go.” He can’t say ‘No’ to old devotees - I tested Him! You must have spiritual maturity to understand Swami. And your life must be in tune with Swami’s teaching – not tuned with what you want; then you can receive sampoorna kripa, complete Grace, and your prarabhda is wiped off. He doesn’t want great performance; think of Him all the time - it’s so easy; naamasmarana. 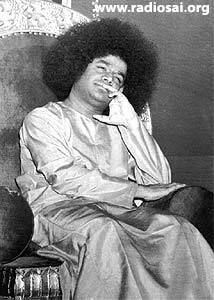 Pray: “Swami, I surrender everything to You!” and be at peace. Once, we were reading the Bhagavad Geeta; the pravriti marga – the two-fold path. He said: “Because you are a good devotee, and you are devoted to Me, and you are doing prayers and sadhana; I will grant you whatever you want in the world! But then, you can’t get Me! You will get everything in the world, but not God! God is Peace! He is Truth, Righteousness, Peace and Love! I am Love and Peace and Compassion! These you will not get! Also, we will not feel any problems with heat or cold – because when it is hot, if we keep saying “Oh! It’s so hot!” that’s a disqualification too! Or when it is cold, if we keep saying: “Oh! It’s so cold! I wish it was warmer!” that means we are reacting to things! Small things should not matter! We should not even comment! So, even if it is the Truth – no doubt – but that comment will make our state of consciousness – which can give us peace – not available to us. We cannot capture that state of consciousness, which is available.